The performance at the Ozark Folk Center in Mountain View, Arkansas in 1993 was certainly unique. The Folk Center was a transformation back in time… with old time mountain music, crafts and interpretations of life in the Ozarks before the 1920’s. It was special challenge to perform our entire show to the live bluegrass music of The Apple Family Band on stage at the Ozark Folk Center. 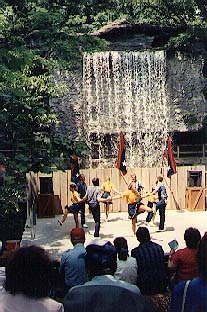 Performing at the Waterfall Stage at Silver Dollar City in Branson, Missouri was a real kick. 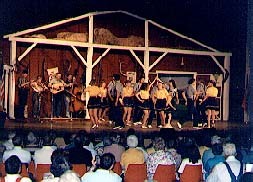 The team participated in the Old Time Music Festival in Branson in 1993 and again in 1996. It was great to be able to perform several shows each day and then attend concerts at the various theaters in Branson in the evenings. Ricky Skaggs was great!